Since many months the value of the EURO has been losing against the US Dollar, dramatically in the last few weeks. Most domain registries charge their fees in US Dollar. We did not forward the recent price increases by VeriSign and other registries to our customers. But now the exchange rates are forcing us to increase the prices for several TLDs which are charged in US Dollar or GBP, coming into effect at the 1st of February 2015. The increase applies mostly to the higher discount rates and is kept at the possible minimum. Each customer will receive an individual e-mail with an exact listing of all changes concerning him. The good news: The prices for several TLDs (where registries charge in EURO) will be reduced at the same time! Often disturbed customers, who received ominuos e-mails concerning their domains registered with deLink, ask us for advice. someone wants to register my domain and my “Internet Keyword” what shall I do? someone sent an urgent payment reminder for my domain, have I got to pay? When you receive e-mails of this kind, please be very cautious! Of course deLink will remind you before your domain expires and tell you whether you have to renew it manually or whether it will be renewd automatically (which is the default method). But there are some very typical methods used to drag the money out of the pockets of domain owners. Very popular: You get an e-mail – allegedly from an internet provider, in most cases from China, but from Hongkong or Switzerland somtimes, too. You are informed that a company, which is totally unknown to you, has requested registration of your domain or your “Internet Keyword”. But it was detected that this request collides with your interest. You should answer asap regading this issue. What does that mean? First of all the story about an alien company requesting your domain is completely fictional in most cases. And there is no such thing as an “Internet Keyword” which could be taken from your. The intention is to put you under pressure! What is the purpose? The sender tries to induce you to register additional domains with different endings and – under pressure – pay exorbitant prices and accept incredible conditions. We have witnessed cases where a customer had to pay several thousand US dollars for just three domains. As soon as you have signed an order fax it will be extremely difficult to escape that trap! Another method method suggest that a domain fee has to be paid – urgently. If you look closer you will find that the payment asked for is not for a domain renewal, but for a search engine submission. The letter is just an offer, not an invoice, though it looks very much like a domain renewal invoice. Very suggestive is a line e.g. WWW.DELINK.INFO will expire on DECEMBER 03,2013 – Act today! But it is only the search engine offer, which will expire – not your domain! If you already had your trademark validated by the TMCH, you may now request the corresponding domains. If not, it is high time to place an order for validation! As a second choice you may request domains without having a validated trademark in the land rush periods of the relevant TLDs – preferred, but rather expensive. Your last chance to get the desired domains is submission to the going public. It is first come first served then – thus a matter of luck. Take a look at our list of the most interesting new gTLD – sorted by categories, start date of sunrise, landrush or going public, to get an overview. Have you already been close to a heart attack after deleting a .de domain accidentally? Until now .de domains were deleted immediately and irrevocably as soon as the request was forwarded to DENIC. And rather often interesting domains were registered by others only minutes later. Now we are done with that: DENIC has introduced a Redemption Grace Period. Since 03.12.2013 the previous domain owner – and the previous domain owner only – has a time limit of 30 days to regain the domain by means of a RESTORE. We appreciate this change of the regulations – domain grabbers presumably less. Detailed information is availabe here at DENIC. Are they really coming now? The registry Donuts Inc. estimates that the 60 day sunrise for some of these Domains could be opened at the end of October 2013 – prices, terms and conditions remain unpublished, however. Did you already apply for a validation of your trade mark at the TMCH? This is the prerequisite to participate during sunrise for each and every new gTLD! Until today 100% of all applications submitted via deLink have been approved by the TMCH. The reason might be the thorough precheck we are doing with your application documents. 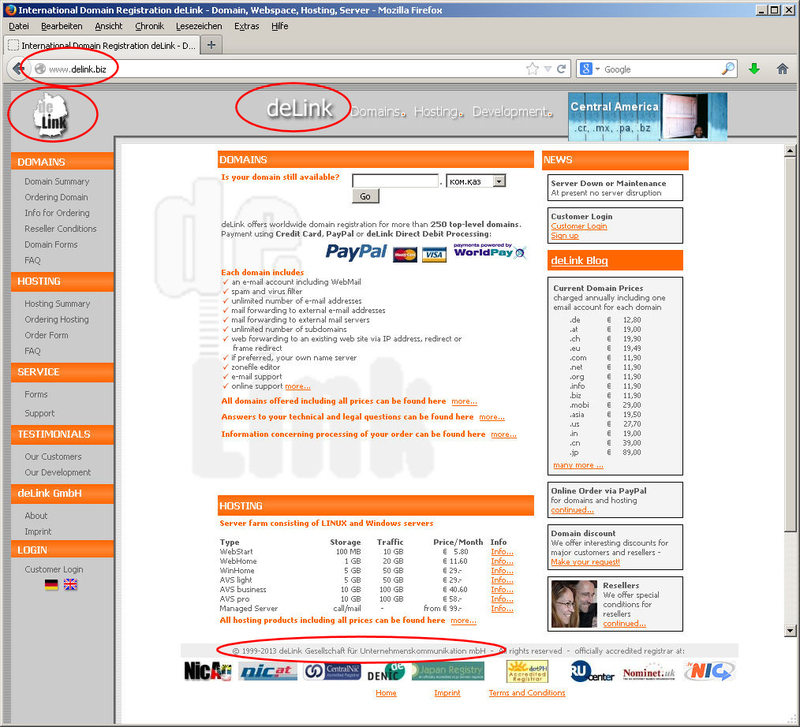 How you can submit your application via deLink very easily is described in detail here. You still have no idea, which of the new gTLD might be important for you? Check here – we have categorized interesting endings. Take advantage of the research we did for you!